For more than three decades, Exmark has been committed to making, flat out, the best turf care equipment in the world. Today, we take great pride in doing it better than anyone else, consistently delivering products designed to not only meet every one of your expectations--but also to EXCEED them. When you're looking for the very best cut, choose the Lazer Z mower by Exmark. We offer a top-of-the-line series of zero-turn mowers that makes lawn care a breeze. For years, the Lazer Z has been the standard of excellence for commercial zero-turn mowers. Today more than ever, the Lazer Z is coveted by landscape pros and homeowners for its cut quality, productivity, durability and up-time performance. Zero turn means just that—there is literally zero turning radius. Our Lazer Z zero-turn lawn mowers save on precious time because they are easily maneuverable and simple to use. When you have a large lawn to maintain, the Lazer Z will make all the difference in the world. The Lazer Z also makes it easy to cut closely around obstacles like flowerbeds and bushes. 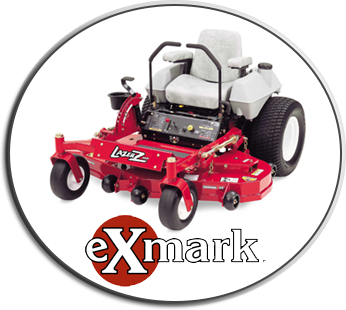 For years, the Exmark Lazer Z has been considered the industry standard for zero-turn mowers. Its legendary durability and up-time performance has made it the go-to for landscape professionals, with our zero-turn mowers purchased 2 to 1 over the next best-selling brand by landscape professionals. The Exmark Lazer Z is unmatched in productivity and durability and continues to lead the industry in innovation. So if you're ready for the best, choose the Lazer Z.